Kumquat & Blood Orange Marmalade. I've had marmalade on the brain. It kind of started with the several jars of it still left on the shelves from last year around this time. It was a good and bitter marmalade, but very soft set - runny even - and I was not grabbing it for my toast as I thought I would. The thing about old jars on the shelf is that they translate as food clutter to me, and I feel true guilt about it. Fortunately, a conversation with Deena some time ago led me to remember that her friend used up old marmalade in granola so that's what I did. I strained out the citrusy bits and subbed it for the honey or maple syrup. 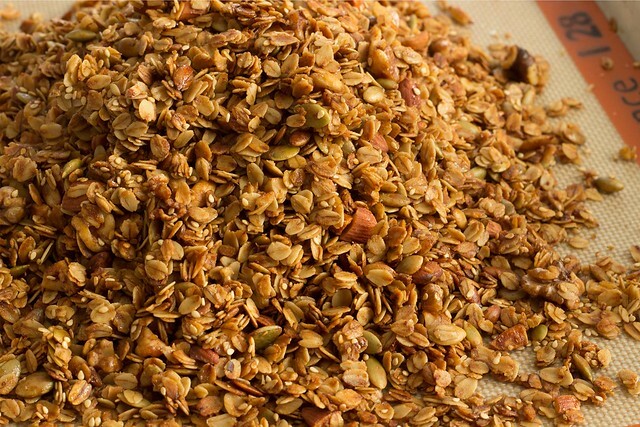 It's good granola: a not stop-dead-in-your-tracks good, but more of a serviceable good. And it's nice and crunchy too. It will not be a bother to eat. It seems with less time to do actual experiments in the kitchen, I have more time to daydream about what I would do if I did have the time. I think about what ingredients I'd like to work with and which flavors I'd combine, and then when the time presents itself I'm more than ready to make the most of it. 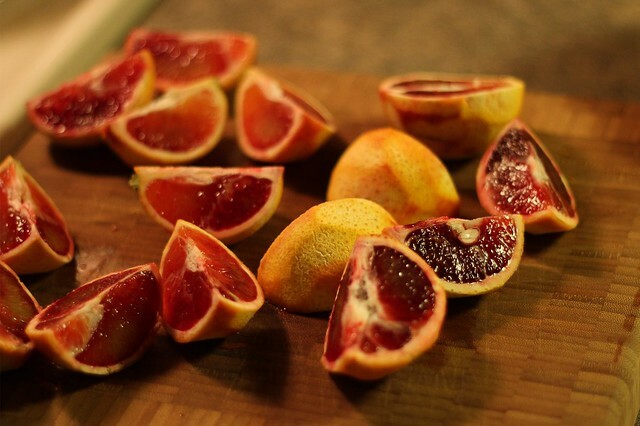 I'd been thinking about combining kumquats and blood oranges for weeks now, since I first saw the two of them popping up on my grocery trips. I wanted to add chiles too because we all know that I'm a complete sucker for sweet and spicy things. 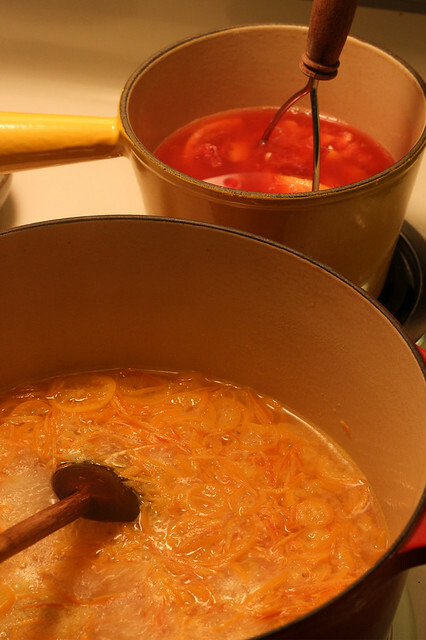 Late last week I finally got my kumquats and blood oranges, and on Friday night after the boys were all in bed I got to begin my 2015 marmalade. This marmalade may exist in some form somewhere else, but if it does, I don't know about it because I did absolutely no research on it. I combined techniques I've read about and done in the past with the wisdom of Linda Ziedrich's ratios, and am beyond pleased with the result. 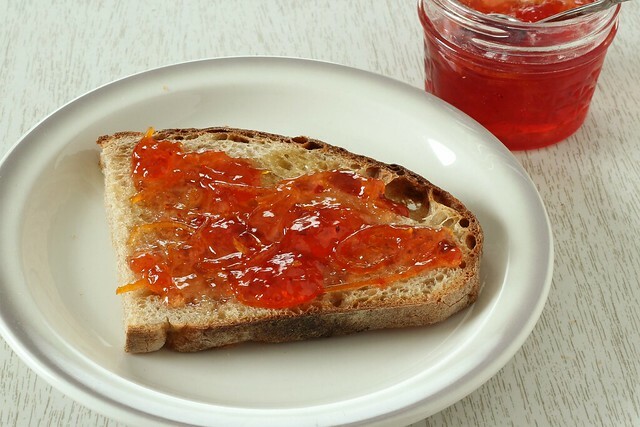 This marmalade is a good balance of sweet and tart and doesn't really read as bitter the way some marmalades do. As a bonus, it's also a gorgeous color. I started tasting a variety of dried chiles after I tasted the sugared blood orange juice/kumquat and orange peel mixture. My original thought was to use guajillos (my favorite) or mulato chiles but I didn't want to overpower the pretty unique citrus flavor going on. Then I turned to my new favorite chile flake the Urfa Biber and decided it was just a little too strong. I settled on New Aleppo, which has a spicy, almost strawberry flavor to it. I'm calling it New Aleppo after reading this article on how the Aleppo now available from northern Syria is unfortunately impossible to get. It's a horribly sad thing, for more reasons that just the loss of a spice. Begin the day before you'd like to can and use organic citrus if possible. Slice the kumquats as thin as possible into rounds. Nick out any seeds and save them on the side. Add the kumquat slices to the orange shreds in the preserving pot, tie up the seeds in a small piece of cheesecloth, and add 3 cups water. Bring the pot up to a boil over medium high heat, then reduce heat and simmer for 15 minutes. Remove from the heat, cover, and let sit overnight at room temperature. When cool enough to handle, pour the mashed blood orange into a jelly bag (or similar) and allow to drain for awhile. (If you get impatient as I do, squeeze the bag to glean as much juice as possible in a shorter amount of time. Generally, this isn't something canners recommend since it can cause cloudy preserves - but I'd always rather have the quantity that the clarity!) 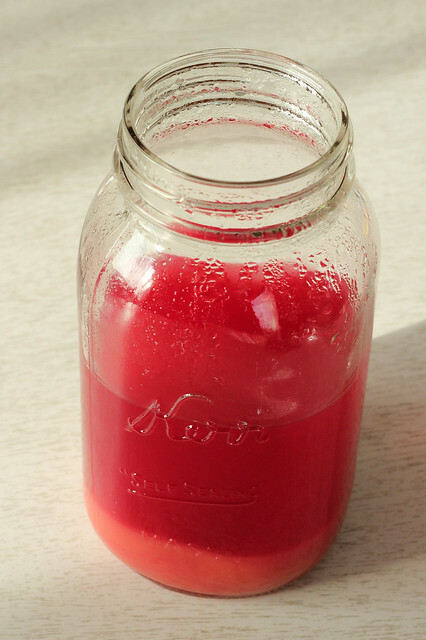 Transfer the juice to a jar and refrigerate until you are ready to continue. Ready jars, lids, rings, and a boiling water bath. Add the blood orange juice, sugar, and Aleppo pepper to the preserving pot (you should have 4 - 4 1/2 cups of total liquid), stirring well over low heat to dissolve the sugar. Then bring the mixture up to a boil over medium high heat. Stir regularly at first and constantly towards the end. Heat to 220 degrees or to desired set on a cold spoon or plate. Take the pot off the heat and let it stand 5 minutes before ladling into jars leaving 1/4 inch headspace. 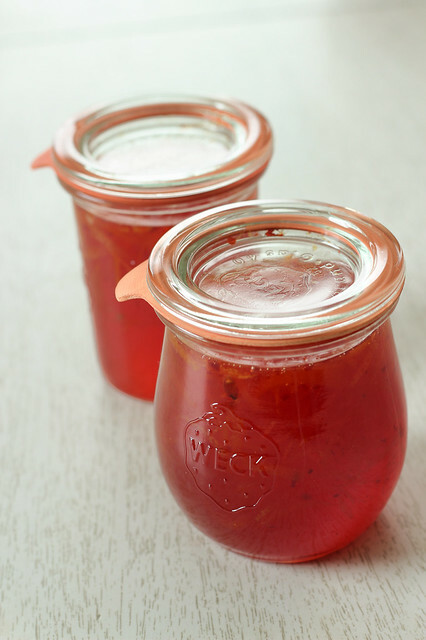 Process in a boiling water bath for 10 minutes, then remove the canning pot from the heat and let the jars stand in the water for 5 minutes before transferring to a towel-lined countertop. I was surprised at how colorful it the blood orange juice remained. At the bottom you can see the sediment that comes from squeezing the jelly bag, I figured it was good pectin and I suspect I was right. When researching my book, I consulted with the Master Preserver at the extension office in Madison about sterilizing jars. I never used to sterilize jars in boiling water before canning sweet preserves, and she advised me that this is not the proper thing to do - or at least proper for sweet (non-vinegar) things that are processed 10 minutes or less. Ever since then, I dutifully put my clean jars in my water bath as the water is coming up to a boil and I let them simmer away until filling them. I still always wonder just how many people do this, but I always then suppose it's not really adding that much work to a small batch of preserves. I might have to make time for another small batch of this marmalade since it was so good I ate almost half of a little 4 oz. jar at breakfast time today. But maybe I'll just appreciate the small batch I have and not over preserve. I do seem to be eating less and less sweet preserves, and not because I don't whole-heartedly love them. Maybe something else will spark my interest in the next few weeks of winter and I can daydream my way into another good combination. I had better save some room on the shelf for that.